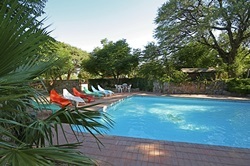 from/to Windhoek via north-eastern Namibia's wildlife parks and nature conservation areas along the Zambezi, Kwando and Okavango Rivers to the Okavango Panhandle, Okavango Delta and the Kalahari Desert in north-western Botswana. This round trip through neighboring regions of northern Namibia and northern Botswana presents the traveller with the unrivaled beauty of both countries' water worlds that are teaming with game and birdlife. Explore the Zambesi Region, Namibia’s semi-tropical wildlife paradise surrounded by the Zambezi, Chobe and Kwando Rivers. Then follow the road all the way down the panhandle of the famous Okavango Delta into the Kalahari, one of the world's most multi-facetted deserts. Meeting people from different ethnic groups along the route is an integral part of this tours. Although it is quite possible to do this safari on a camping-only basis, Unique Tours & Safaris recommend that first-time visitors interested in this routing consider giving preference to lodge accommodation. A combination of camping and mostly dining in the restaurants of next-door lodges is also a viable option for those unfamiliar with shopping facilities located hundreds of kilometers apart. The driving is easy though, predominantly on tar roads - ENJOY! 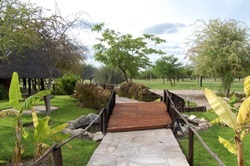 Upon arrival at Hosea Kutako International Airport, take over your rental vehicle and proceed to your accommodation, situated outside Windhoek. 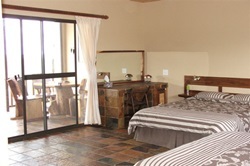 The surrounding bushveld provides first impressions of the beauty, sounds, and scents of Namibia’s wild and your hosts will let you have a first impression of Namibia’s so famous hospitality. After a sumptuous breakfast you are hitting the road, travelling north via Okahandja and Otjiwarongo to the Waterberg Plateau. For sightseeing, a stop at the wood carvers market in Okahandja is recommended, where some very nice wooden and stone figures are on offer. Once at your accommodation, you have the opportunity to admire some of Namibia's predator cat species from close quarters, during an optional guided activity. 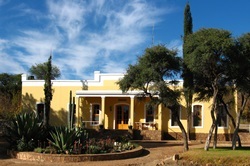 Allow yourself to be spoilt by your hosts’ exceptional hospitality and enjoy the magnificent vistas from the lodge. The close bye Cheetah Conservation fund is well forth a visit. Today, you are getting even closer to the water-rich realms of north-eastern Namibia. Before your first encounter with one of the world's most unusual rivers, the Kavango - that represents the Namibia/Angola border and further south, in Botswana, becomes the Okavango -, you can join an activity to meet some of Namibia’s Bushmen. Since the activity starts early departure must be early too or you extend the trip by a day and take it slow. 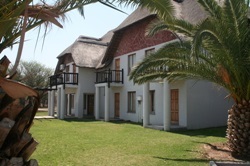 On the fringes of the Kalahari Desert and the bushveld lies a small oasis situated on a typical Namibian farm. The owner-manager grew up with the San and, as a guide who speaks their language, facilitates meetings with the “Little people of the Kalahari”, members of the oldest human race still alive. Proceeding north you reach Rundu and the Kavango, the river that originates in the highlands of Angola and never reaches the ocean. Near Rundu it is still relatively slow flowing and its opposite banks are still close enough to catch a glimpse of Angola. 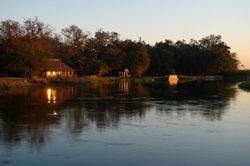 Although not deep enough for larger boats and ships and treacherous for its crocodile populations, the perennial Kavango is busy with fishermen in traditional dug-out canoes, with locals doing their washing, and motor-boats carrying shopping loads to lodges and villages along this stretch to the east and west of Rundu. Travelling in a south-easterly direction from here, you leave the Kavango River behind, only to re-join it again in the Divundu area where a series of steep rapids named Popa Falls as well as a little further south, towards the border with Botswana, lies the Mahango Game Reserve. 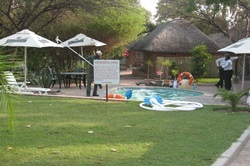 It is traded as one of the most beautiful game reserves of Namibia. The next leg of your journey takes you through the Bwabwata National Park, formerly named Caprivi Game Park. It covers most of the Zambesi’s panhandle, the area between the Kavango and the Kwando Rivers. Originating from Angola, the Kwando divides the Caprivi Strip from the Caprivi Head and flows all along the border shared by Namibia and Botswana. 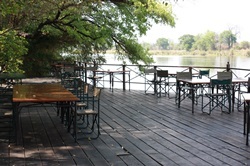 Its name later changes from Kwando to Mashi, and Linyanti and eventually it becomes the Chobe River that joins the Zambezi further to the east. 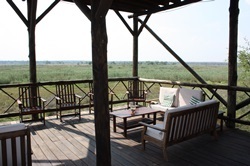 On a peninsula in the Kwando River nests your next destination. You are back-tracking via Divundu to the Kavango River for one overnight near the Popa Falls in order to allow for an early departure to Botswana the following morning. Enjoy an optional excursion by boat for viewing the Popa Falls and some excellent bird watching or simply take in another stunning sunset over the Kavango River, from the comfort of your accommodation. With only the Mahango Game Reserve situated between the lodge and the Namibia/Botswana border, an early departure provides the opportunity to enjoy some more game viewing in Mahango. Proceed south along the river changing to Okavango River, inside Botswana, which splits into two main channels that are inter-connected by smaller side-channels. The main waters pick up speed and the river's flood plains increasingly become wider, before it branches out into the Okavango Delta. Your next accommodation, near the village of Shakawe, offers an optional afternoon boat excursion, highly recommended, as the Okavango Panhandle provides a very special river experience and wonderful birding with the large Giant Fish Eagle as well as the Carmine Bee-Eaters that breed in huge colonies in the river banks. Photos can be taken all day long, as there are more than enough opportunities. How about taking the advantage of taking in the very special atmosphere of the delta while silently gliding through the glass-clear waters of inter-twined channels lined by 2m tall papyrus and across lagoons covered by water lilies in a Mokoro, a traditional dug-out canoe hewn from a single tree trunk? 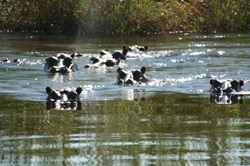 Unique Tours & Safaris can make many such fantasies of the unique Okavango Delta become reality - you just have to let us know what’s on your mind. Optional afternoon activities are on offer at your accommodation but perhaps you might just like to spend the remainder of the day updating your travel diary in quiet and relaxing surroundings. Say your fare-wells to Botswana and take the road back to Namibia. Via Buitepos border post you enter Namibia and travel westwards through the mostly dry landscape on the edge of the fascinating Omaheke Desert. A half-day's drive on a good tar road takes you back to Namibia's capital city, Windhoek, and - your flight's departure time permitting - , there might be opportunities for some last-minute souvenir shopping and lingering over a drink at one of the cosy street-side cafés.